Milwaukee will host the 2020 Democratic National Convention, party leaders announced Monday, highlighting the battleground state of Wisconsin that helped elect President Donald Trump and now will launch an opponent who could oust him. Democratic National Committee Chairman Tom Perez chose Milwaukee over Houston and Miami after deliberations lingered longer than party leaders or officials from the three finalist cities had expected. "This choice is a statement of our values," Perez said in a statement. "The Democratic Party is the party of working people, and Milwaukee is a city of working people." It will be the first time in over a century that Democrats will nominate their presidential candidate in a Midwestern city other than Chicago. Instead, the political spotlight will shine for a week on a metro area of about 1.6 million people. Once dubbed as "The Machine Shop of the World," the working-class city also is known for its love affair with beer and as the birthplace of Harley-Davidson motorcycles. Democrats see plenty of symbolism in Milwaukee after a bitter 2016 election defined by Hillary Clinton being nearly swept in what her campaign aides had confidently called a "Blue Wall" across the upper Midwest and Great Lakes region. That band of states twice sided with President Barack Obama, but Clinton held only Minnesota, ceding Wisconsin, Michigan, Ohio and Pennsylvania — a combined 64 of the necessary 270 electoral votes — as white working-class voters flocked to Trump. The president won Wisconsin and its 10 electoral votes by about 23,000 votes out of almost 3 million cast, the first time since 1984 that Republicans claimed the state in a presidential election. Afterward, Clinton took withering criticism for not once visiting Wisconsin as a general election candidate. Since then, Wisconsin voters have re-elected Democratic Sen. Tammy Baldwin and ousted Republican Gov. Scott Walker in favor of Democrat Tony Evers and the state's first black lieutenant governor, Mandela Barnes. "There is no better place to showcase the Democratic Party's vision for the future than in Wisconsin," Baldwin said in a statement. Wisconsin Democrats pointed to those midterm election results as they lobbied Perez and DNC officials, and presidential candidates already are paying attention. Democratic Sen. Amy Klobuchar of Minnesota came to Wisconsin in one of her first trips as a declared candidate. In a political twist, Milwaukee officials have credited Walker for supporting the convention bid. Democratic Party proceedings will play out in the new 17,500-seat arena that Walker helped build for the NBA's Milwaukee Bucks by securing public financing from state lawmakers. Walker later lobbied GOP-leaning business leaders and donors to support Milwaukee's effort to land the DNC. "When it comes to a big convention like this, it's not red, it's not blue, it's green," Walker told The Associated Press. "It's the money that will come into the state." While Democrats expressed enthusiasm, Walker said hosting the convention may result in previously complacent Wisconsin Republicans paying more attention and getting motivated to vote for Trump. "I think you'd be hard-pressed to find anyone who leans Democrat who wasn't already motivated in the city or the state against the president," Walker said. Wisconsin's Republican U.S. Sen. Ron Johnson concurred with Walker, saying having the convention in his state will help motivate GOP voters by revealing Democratic "socialist tendencies." 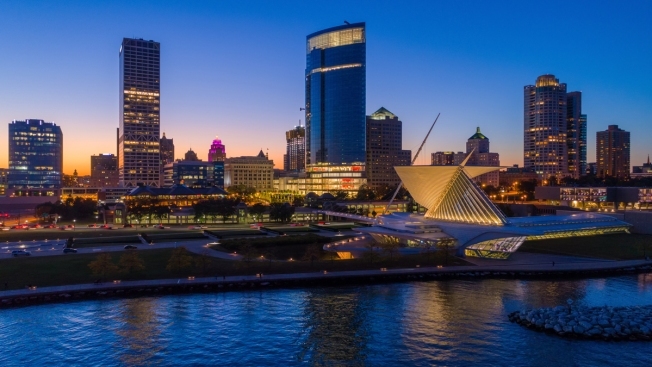 Milwaukee organizers pitched their city — the Democratic stronghold of Wisconsin — as resurgent. Known for some of the country's biggest brewers, including Pabst, Schlitz, Miller and Blatz, the metro area has a redeveloped downtown, a hotel capacity exceeding 17,000 rooms and a new downtown streetcar line that opened in November. DNC officials have said that the question wasn't about hotel rooms but about whether Milwaukee has requisite venues for other convention staples, from daily sit-down breakfast meetings for 57 state and territorial delegations to evening events put on by state parties, corporations, lobbyists and donors. Even as Milwaukee officials insisted they have the venues, some deep-pocketed Democrats in nearby Chicago — a 90-minute drive — stepped in to note their proximity. Miami has an impressive concentration of luxury hotels, but many are in Miami Beach across bridges from downtown. That raised the prospect of delegates spending hours in traffic. The city's arena also is not as new as Milwaukee's. Houston had few if any logistical barriers. But according to party officials with knowledge of the process, the city's organizing committee struggled to come up with the necessary financing without resorting to oil and gas money. That industry is the city's bread and butter, but it's become anathema in Democratic politics because of its part in climate change. The city's Democratic mayor also is embroiled in a labor dispute with Houston firefighters.